It was the first time that the Prince Lubricants Caterham Motorsport Championship had raced in the Philippines. And the Clark International Speedway provided yet another weekend of close, intense racing from the Caterhams. With the support of AirAsia, some twenty five team personnel and sponsors made the trip to the Philippines, including a number of TOC technicians who made up the race crew. All of the technicians had previous experience working with Caterham at the races, so they could hit the ground running, unpacking the freight containers and preparing the cars, despite suffering travel delays and arriving in Clark at 5am on the Thursday morning! 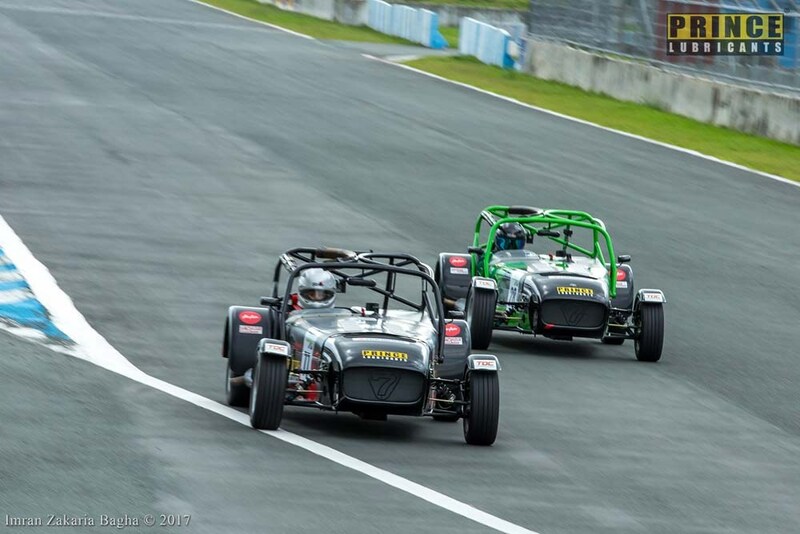 Supporting the Philippine GT Championship, the Caterham Motorsport Championship ran three races over the weekend with rain starting the introduction for the Caterham drivers who had never raced at this circuit before. The 420R class was once again dominated by Singaporean young-gun Daim Hishammudin, supported by AirAsia. Storming off the grid, Daim laid down his dominance from the start, and lapping drivers up to the second place runners of the Supersport class. As the track got slippery towards the end due to rain, Daim was able to control the car impressively to take the chequered flag. In Race Two, the Singaporean once again took the win, with another very close battle between Marcus Chye and Rocky Siow, who exchanged places a number of times before Marcus claimed second at the flag. Things were a little different in Race Three as Daim had a slow start off the line and was in third position going into turn 1. From that point on it was fun watching the more experienced racer of Malaysian veteran Marcus Chye fending off the eager young Daim. But in the end Daim pulled off a daring move against Marcus and was able to just cross the line for his third win of the weekend and his eighth consecutive win of the season, further increasing his championship lead by 28 points. The Supersport class was dominated by local hero Tyson Sy as he won all three races. But his wins were not a walk in the park, and certainly had to fight for them after having small incidents that sent him towards the back of the field in races 2 and 3. Finding the race craft and speed from his old days of racing ten years ago helped Tyson storm through the field and take the hat trick of wins. Battling it out for the final two steps on the podium, was Halim Mu’Azzam and Sidqi Ahmad once again giving spectators an enthralling show, with both drivers exchanging places and attempting daring passing moves. Another local driver representing the Philippines – Jason Choachury – was in amongst the battles early on until drifting back into the pack and having an exciting race against 2016 champion Shirendra Lawrence. As with most Supersport races, we were treated to another bumper-to-bumper close fight, with pole sitter Tyson Sy slipping back through the field after a poor start. But his experience and determination saw him fight through the field to score his third win of the weekend, with Halim and Sidqi finishing second and third respectively. Mid-field battles were fun between Sheran Fernando and Sophia Low who both fought valiantly on this new circuit. Both drivers scoring valuable points for their championships. It was a very challenging but satisfying race weekend and special thanks go to Prince Lubricants, AirAsia and to the TOC technicians for all their hard work.